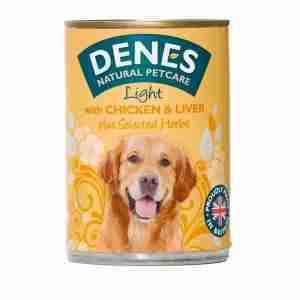 Denes Light Dog Food uses a reduced calorie recipe that is low in salt and high in fibre. Perfect for dogs that are prone to weight gain. The range provides complete balanced diets suitable for all dogs of all ages and lifestyles. Denes has promoted a natural and healthy lifestyle for cats and dogs since 1951. Fresh pork 12%, fresh chicken 8%, wheat, fresh pork liver 4%, dried chicken 3%, carrots, minerals, herbs (kelp, garlic, and parsley).